Instantly improve safety and security at home with no wires or electricity. 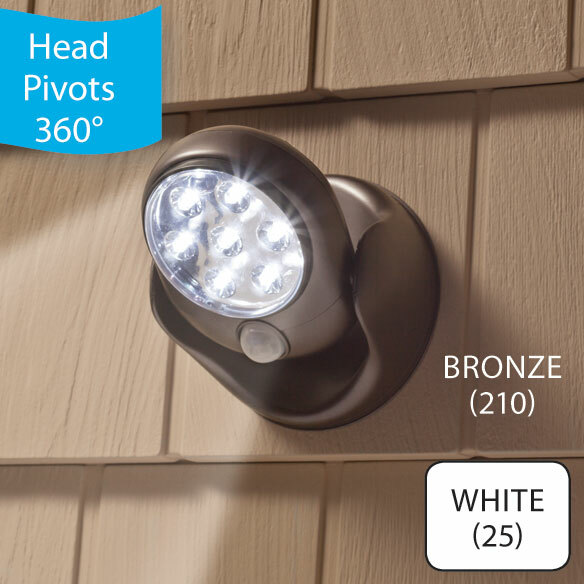 Deluxe motion activated wireless LED light turns on when it detects motion up to 10 ft. Pivoting head and 360° rotating base direct 7 bright LED bulbs where needed. Easy installation. Weather resistant for indoor/outdoor use. Requires 4 AA batteries (not included). 5"W x 5 3/4"H. Plastic. I love this light - it probably will not hold up with rough handling as in too many adjustments. However I do recommend it for a good bright light that does what the advertising says - stays lit for 30 seconds when it detects movement. I think it would also be very good for the elderly who tend to walk about at night and forget to turn lights off which is wasteful of their electricity. I'm also thinking about installing one in my barn with a horse who is night blind. VERY USEFUL TO ILLUMINATE ENTRANCE AT NIGHT. bought one before it works great needed for other areas. Need this for when I go into my garage so that I won't keep turning on the light to go in and out of the fridge. Compared favorably with other options including price. Looked like the best light for the place I needed it. I've had friends that used this product, it was easy to install and gave off plenty of light. Set this light above our front door so it comes on at night when we walk up to the door. We can now see to open the door. The last one we had lasted about 4 years. I live alone & need the outdoor security. this was a poor choice it attracted the moths and burned out the bulb in one night. It is wireless. I am going to put in on my shed in the backyard for my dogs. It is motion activated so it should just turn on when it senses motion. My husband thought this would work good. 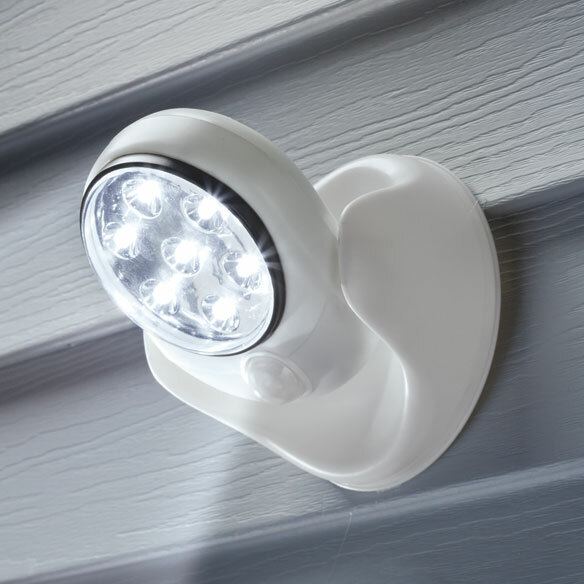 Been looking for an easy motion detector light for inside garage that is too multi-pole for light switch motion detector. This one's portable & battery operated. Should work great. I bought two for a wilderness camp in Maine and they work exceptionally well. Have several of these lights in the front and side of the house. wanted to get a few for the back area. This is my second light that I have purchased. My mother is elderly and leaves the lights "ON". This was the best thing I could have ever bought. I would definitely recommend it! My sister gave me one of these lights and I simply love it. It is easy to install and the quality of lighting that it gives off is really good. I would recommend. Battery better than solar. Hope it is bright. BEST ANSWER: Thank you for your question. The lumens for this item is 13,000 MCD. We hope this information will be of help to you. After adding new batteries how to put back? how is it mounted ? BEST ANSWER: Thank you for your question. The Deluxe Motion Activated Wireless LED Light is mounted by screws. We hope this information will be of help to you. The fixture is twist locked onto the base plate, which is attached to the wall or outside surface by three screws.